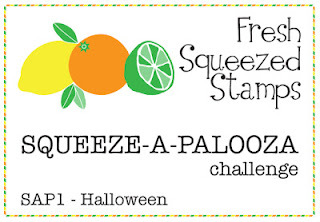 Fresh Squeezed Stamps--Stamp Your Background! 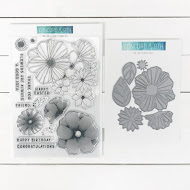 Today I am sharing cards from my guest design over Fresh Squeezed Stamps. 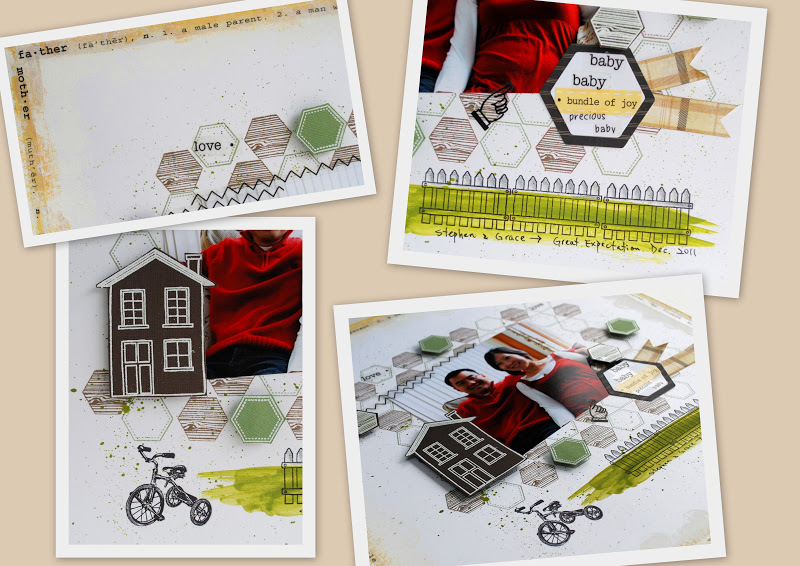 This Happy Hexagon is definitely fun and versatile to play with! I created a calm and serene card with this set. Lastly, let's talk about Halloween.....it is Halloween today after all! 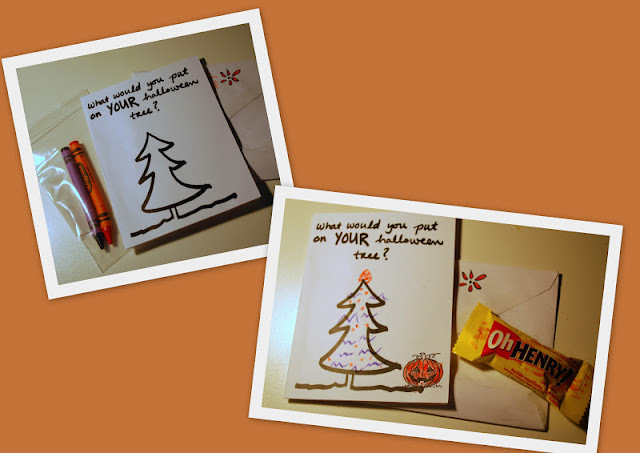 One of my lovely blog followers Chrystina sent me a card along with two crayons (cute idea!!) yesterday and asked: "What would you put on YOUR Halloween tree?" And my all time favorite Halloween candy is the good old-----> Oh Henry! Hello! 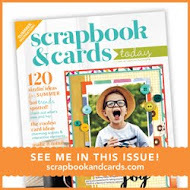 I am sharing a card that was created with Moxie Fab World's Alphabet Stickers Challenge in mind. 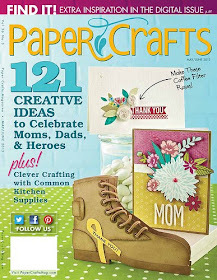 I happen to have a cupcake image and some Making Memories and SRM Stickers lying around in my craft room. The cupcake was made with alcohol inks (hm....YUM!!). The sentiment are mostly SRM Sticker except the letters Y-O-U (from Making Memories). There you have it! Thank you for tirelessly leaving me comments here in my blog. If you are here to link up the birthday card for Barb, please click here or the link under the blog header. Thank you! 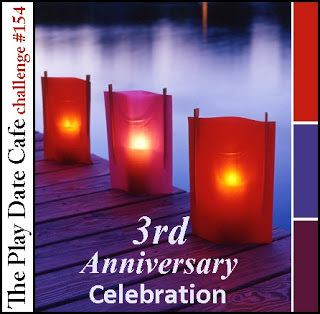 Aren't the colors over The Play Date Cafe Challenge gorgeous? I actually had some trouble getting the minty color right. This was actually my first take. I still like it! Thoughts about this card: sometimes you don't know what to do with the everyday objects in the stamp sets. For this ornate arm chair, with the right sentiment, the object fits the theme so perfectly. I also think a square card makes a "proper statement". That circle border stamp from CAS-ual Fridays Stamps was fun to emboss! With that said, we should never underestimate the power of circles and line stamps. Making this card reminds me of this photo that we took this past August. I am loving the color challenge lately....perhaps you can tell. I am always intimidated by certain color combos. These days I am really stretching my creativity on trying to use just the right amount of colors..... Thanks SO much for stopping by! Today is a very special day since it is my dear friend Barb's birthday! I organized a mini surprise blog hop to celebrate this special day as I know that Barb would love this! 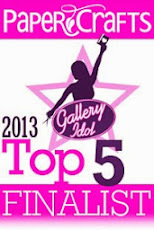 If you are into Hero Arts Flickr and card-blogging, you will sure to know Barb Engler! She is fabulous, helpful and genuinely lovely! I had the luck to finally meet Barb in person this past September. She is just the same as you see her on line--enthusiastic and sweet! Here is my card for Barb because she sure brighten my day every time she visits my blog.I finally made a card with the Velveteen technique. It hardly shows in this photo, but when Barb gets this card, she can definitely see the white stamped details! Here are our blog hopper/party guests who are celebrating along with me. We were all once the Hero Arts hostesses for the Flickr Group and it was such FUN to meet each other at ScrapFest this past September. Please stop by Barb's blog to wish her a happy birthday! If you are interested in making a virtual birthday card for Barb, please link it up (see the following InLinkz) and share with us! I know Barb will love love love this! I had challenged myself to make non-candy Halloween Treats. I made these "treats" with the SRM Tubes. They are perfect for grownups....or even kids! Because ANYONE can use some bath salt to treat themselves and relax in the tub at the end of the day, right? Hope this inspired you to make some non-candy Halloween treats! Woot woot!! This is going to be a VERY special CAS-ual Friday's Challenge! We are, for the very first time, having CAS-ual Fridays Stamps as our official sponsor for the challenge! 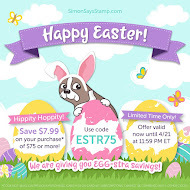 Stamps are the finest quality photopolymer and made in USA. They stamp beautifully if I can give you an honest opinion....The quality is great! 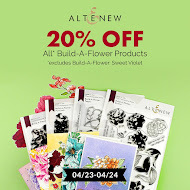 I am, of course, using the new stamps from Woot Woot for today's challenge! Can you tell that I had lots of fun putting this card together? First, I gathered all the sentiment from this set and arranged them all on a square acrylic block. Then STAMP and EMBOSS! Later I realized that I used "it's your birthday!" on the far right corner..., that will not work with the encouraging sentiment! SO....that's when the white paper flower came to the rescue! This was all done after adding the jute and buttons!! This card definitely has more embellishments than I had originally intended, but it works, right? 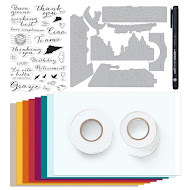 Now please know that you can use any stamps/ pattern paper to take part in the CAS-ual Fridays challenge. Please link up your CAS project to CAS-ual Fridays by Thursday Nov. 1, Eastern Time. I can wait to see your Kraft creation! RIC #22 looks like a ton of fun! It all came down to stamps, inks and sticker (sentiment)! with hard foam sponges. Then I cut them out and fitted them together like piecing the puzzles. The SRM Sticker was then applied over the lines. 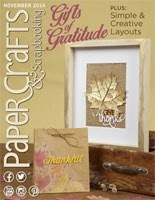 I also created ornate chipboard for the focal point. In the case of runway photo, it was the gorgeous face of the model. 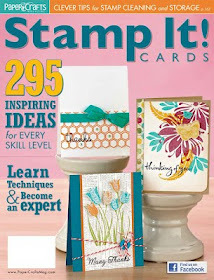 PS: Don't forget to check the CAS-ual Fridays Stamps Blog and see if you are the new stamps giveaway winner! 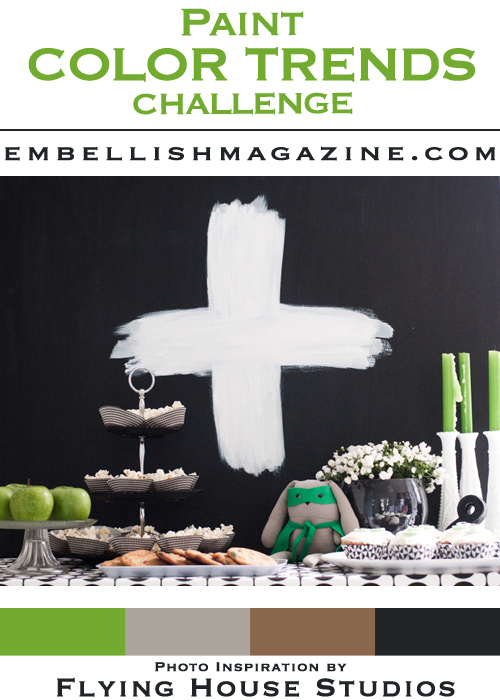 The latest Embellish challenge has me inspired! I love the subtle colors...they are so sophisticated. The element of paint has my interest peaked! But...how to go about it? No idea! The other day I was looking though my piles on craft desk and realized that I haven't made a layout for ages. I have always wanted to make a page for my nephew Stephen and his wife Grace...but I never got to. This color challenge sort of gave me a push to make a layout for this almost one-year old photo! Without further ado, I present you..."The Great Expectation"
It is a lot more work making a layout than a card. I am not going to deny that! But it is very satisfying to see a page coming to life! I can't wait to make layout for their baby! I'll keep you guessing whether they had a boy or girl! Till then! 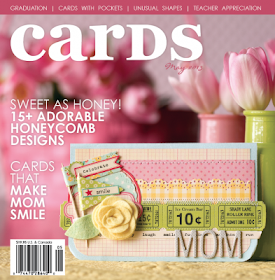 PS: If you can't get enough of hexagons miss seeing card with Happy Hexagons today, please scroll down or click here. Most of us find making masculine card more of a challenge. However, with the right kind of stamps, it's really easy to do! This Happy Hexagon from Fresh Squeezed Stamps proves to be a very versatile set! Here is my take of a manly card. With the layered stamping, I kept the colors bright and neutral. With the colors, patterns, shapes, what more can a guy ever ask for ;) ? And did you know? Fresh Squeezed Stamps has a fun new challenge (details here). 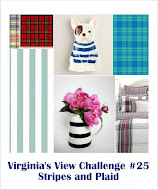 You can download the free digital image and join the fun challenge! 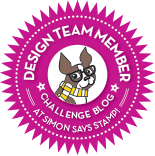 CASe This Sketch & PDCC Challenge! Here is Challenge #1 CAS(E) this sketch! 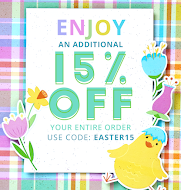 I used a lot of white space for this card because the color combo is so deep and rich! Yay, it's here again. 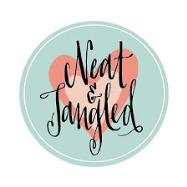 Today is the day that I share my 2nd guest design project with you for Neat and Tangled. 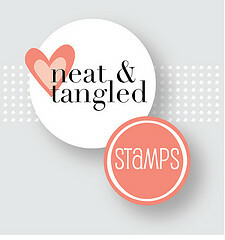 Thanks in advance for leaving me some love over Neat and Tangled! CAS-ual Fridays Stamps Sneak Peek (Day 2)! Hello! Today is an exciting day since it is the sneak peek for the CAS-ual Fridays' new stamp set. ~~Stamps are the finest quality photopolymer and made in USA. 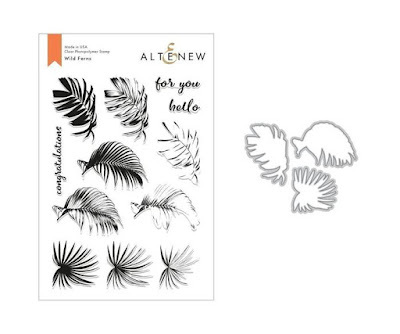 ~~ 5 sets in the new release, one set being revealed each day. ~~One set will be given away from each release day and all you need to do is-----> comment in the Store Blog on each of the sneak posts for their chance to win. ~~ If you are joining the party a little late, no problem. As long as you comment by 11:59 pm on Wednesday (Eastern Time). You could be the winner! 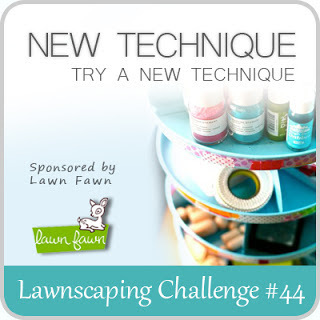 ~~You can also play along in this week's challenge for a chance to win the entire release. It gives me great pleasure to introduce you the new CAS-ual Friday's Stamps-Woot Woot! I embossed the circles and lines and basically created my own pattern paper background with the various distress inks. Then I used the Martha Stewart circle punch to cut out the circles. I added the teal perfect pearl to the Feathered Peacock distress inks to give it the extra shine. 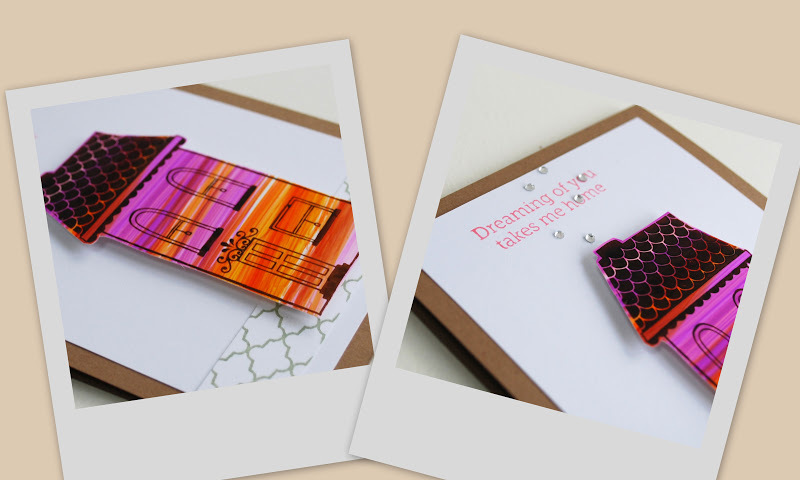 Please check out the Store Blog for more inspiratin and comment to win! 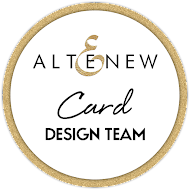 I know you will enjoy seeing the eye candy from our very talented design team. Thanks so much for stopping by! Today I am sharing a card with Paint Dabbers (Snow Cap) from Rangers. It really is not a technique, I think, but it's definitely something new for me to try.... I decided to dab the paint on colored Bazzill card stock and created snow hills. With the textured white paint, the snow hills look pretty cool and there are no added bulk to this card. BINGO! I guess this will be fine for the Lawnscaping Challenge! I also did something out of the norm...emboss the trees in Zing Orange Powder. With some fussy cutting of the trees ( 3 are the maximum, otherwise it's too much work) and white embossing for the snowflake/snowballs, this card is done!! At the end, I dressed up the trees by adding the pearls...after all, it's a Christmas card! Here is the CAS-ual Friday's new stamp release sneak peek! Here is CAS-ual Friday's Challenge BIG announcement, in case you miss seeing it! Hope you are having a great week so far. Let's dive into our usual CAS-ual Friday's Challenge, shall we? WAIT!! 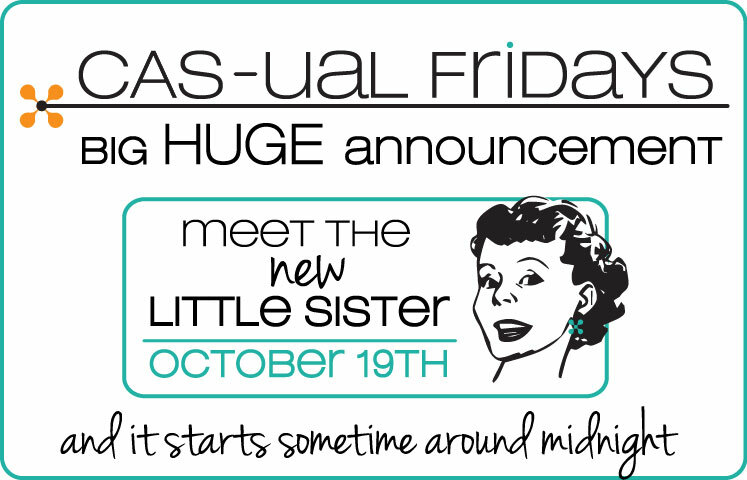 This is a VERY special week to reveal what has been in the making for CAS-ual Fridays! Oh my, oh my, you will love what you see! And now...do you know what stamps I used? By the way, this card measures 4 1/4" x 5 1/2". It will fit perfectly in a regular envelope! I hope this challenge makes you feel a little edgy...and try to think outside the box card stock , so to speak! Please link up your CAS project to CAS-ual Fridays by Thursday, Oct. 25, noon, Eastern Time. 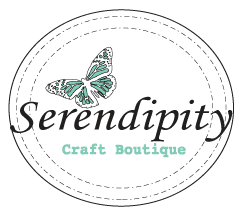 I look forward to check out your creation! 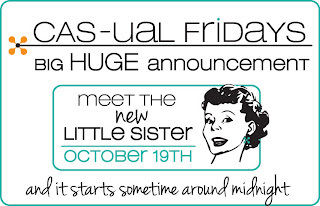 It's going to be an exciting week at CAS-ual Fridays blog. I can't wait to see it unfold.....Thanks so much for stopping by! It's been a while since I played Tuesday Trigger (Val de Victorian). When I first saw the trigger photo, I had no idea how to go about it. I happen to miss playing with alcohol inks and then I thought...why not combine the two? I re-did another card (yes, you call me obsessed!!) 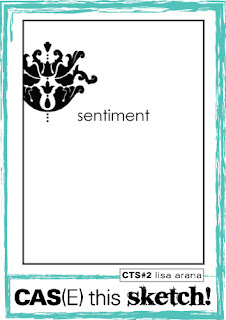 with the combination of dye inks and chalk inks.The sentiment and ornate borders (at the bottom) are SRM Stickers. 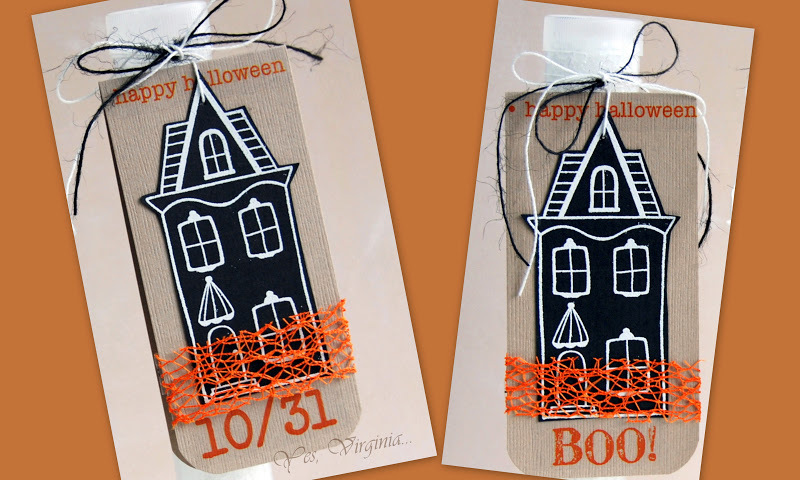 I basically used the back of a clear rectangular stamp to create the color blocks and then stamped the house over. 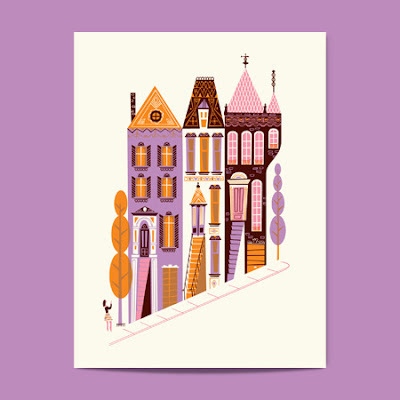 The roof was stamped on white card stock and then pop dots were added for extra dimension. The card was not hard to make, but it did take me a few trials and errors to get it "right". So my inquisitive mind likes to know....which version do you like better!? Virginia: I think I like the answer A better---it's so ME! Dr. John: My answer would be A! First impressions are important. Card #1 drew my attention, then I looked at the details. The colors really pop! Love love love the alcohol inks and the sentiment is DARLING (said it sarcastically). I know what a good card design is when I see it! A Christmas Card with New Stamps! 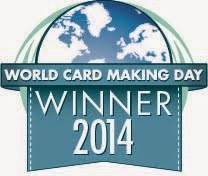 Happy World Card Making Day-take 2! 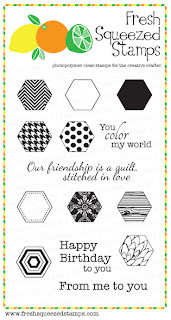 Fresh Squeezed Stamps (Happy Hexagons)!